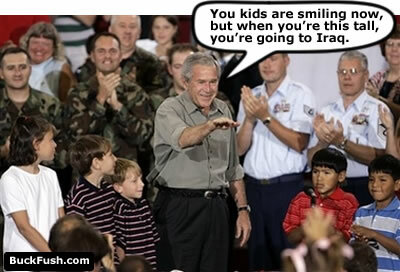 TvNewsLIES.org • View topic - Iraq Body Count! Pfc. Henry G. Byrd III, 20, of Veguita, N.M., died June 24 in Landstuhl Germany, from a non-combat related illness sustained June 18 while in Iraq. His death is under investigation. Spc. Eric C. Palmer, 21, of Maize, Kan., died June 24 at Landstuhl Regional Medical Center, Landstuhl, Germany, of wounds suffered when his unit was attacked by insurgents using small arms fire June 21 in Bayji, Iraq. He was assigned to the 1st Battalion, 505th Parachute Infantry Regiment, 3rd Brigade Combat Team, 82nd Airborne Division, Fort Bragg, N.C..
Sgt. Trista L. Moretti, 27, of South Plainfield, N.J., died June 25 in Nasir Lafitah, Iraq, when her unit was attacked by insurgents using indirect fire. She was assigned to the 425th Brigade Special Troops Battalion, 4th Brigade Combat Team (Airborne), 25th Infantry Division, Fort Richardson, Alaska. Pfc. Andre Craig Jr., 24, of New Haven, Conn., died June 25 in Baghdad, Iraq, of wounds suffered from an improvised explosive device. He was assigned to the 2nd Battalion, 16th Infantry Regiment, 4th Infantry Brigade Combat Team, 1st Infantry Division, Fort Riley, Kan.
Sgt. 1st Class Nathan L. Winder, 32, of Blanding, Utah, died June 26 in Ad Diwaniyah, Iraq, of wounds sustained from enemy small arms fire. He was assigned to the 2nd Battalion, 1st Special Forces Group (Airborne), Fort Lewis, Wash.
Cpl. Derek C. Dixon, 20, of Riverside, Ohio, died June 26 while conducting combat operations in Al Anbar province, Iraq. He was assigned to 2nd Assault Amphibian Battalion, 2nd Marine Division, II Marine Expeditionary Force, Camp Lejeune, N.C.
Last edited by dori on Sat Jul 07, 2007 11:44 pm, edited 1 time in total. Staff Sgt. Daniel A. Newsome, 27, of Chicopee, Mass., died June 27 in Baghdad, Iraq, of wounds sustained from an improvised explosive device. He was assigned to the 1st Battalion, 8th Cavalry Regiment, 2nd Brigade Combat Team, 1st Cavalry Division, Fort Hood, Texas. Sgt. William W. Crow Jr., 28, of Grandview Plaza, Kan., died June 28 in Baghdad, of wounds sustained when his vehicle was struck by an improvised explosive device. He was assigned to the 2d Battalion, 16th Infantry Regiment, 4th Infantry Brigade Combat Team, 1st Infantry Division, Fort Riley, Kan.
Pfc. Cory F. Hiltz, 20, of La Verne, Calif. died June 28 of wounds sustained when their unit was attacked in Baghdad by insurgents using improvised explosive devices. They were assigned to the 2nd Battalion, 12th Infantry Regiment, 2d Brigade Combat Team, 2d Infantry Division, Fort Carson, Colo.
Staff Sgt. Robb L. Rolfing, 29, of Milton, Mass., died June 30 in Baghdad, Iraq, of wounds sustained from enemy small arms fire. He was assigned to the 2nd Battalion, 10th Special Forces Group (Airborne), Fort Carson, Colo.
Last edited by dori on Tue Jul 03, 2007 10:19 am, edited 2 times in total. How many more Surges will it take for people to realize that we are running out of troops to send.. There's always more babys to take their place, but will there be any adults to change their diapers or bark out commands? Leadership and decisionmaking seems to be the worst problem. Leadership always starts from the TOP down, and you get EXAMPLES from your leaders as to how you are supposed to act and react to situations..
Staff Sgt. Michael L. Ruoff Jr., 31, of Yosemite, Calif. died July 1 in Ta’meem, Iraq, of wounds sustained from enemy small arms fire. Buchan was assigned to the 1st Battalion, 18th Infantry Regiment, 2nd Brigade Combat Team, 1st Infantry Division, Schweinfurt, Germany. Ruoff was assigned to the 1st Battalion, 77th Armor Regiment, 2nd Brigade Combat Team, 1st Infantry Division, Schweinfurt, Germany. Spc. Victor A. Garcia, 22, of Rialto, Calif., died July 1 in Baghdad, Iraq, of wounds suffered from enemy small arms fire. He was assigned to the 1st Battalion, 38th Infantry Regiment, 4th Brigade, 2nd Infantry Division (Stryker Brigade Combat Team), Fort Lewis, Wash.
Pfc. Jonathan M. Rossi, 20, of Safety Harbor, Fla., died July 1 in Baghdad, Iraq, of wounds suffered when insurgents attacked his unit using an improvised explosive device and small arms fire. He was assigned to the 2nd Battalion, 12th Cavalry Regiment, 4th Brigade Combat Team, 1st Cavalry Division, Fort Bliss, Texas. Lance Cpl. Juan M. Garcia Schill, 20, of Grants Pass, Ore., died July 2 while conducting combat operations in Al Anbar province, Iraq. He was assigned to 2nd Battalion, 7th Marine Regiment, 1st Marine Division, I Marine Expeditionary Force, Twentynine Palms, Calif.
Lance Cpl. Jeremy L. Tinnel, 20, of Mechanicsville, Va. died July 1 from a non-hostile boat accident in the Euphrates River just off the shore of Al Anbar province. They were both assigned to 1st Battalion, 2nd Marine Regiment, II Marine Expeditionary Force, Camp Lejeune, N.C.The accident is under investigation. 1st Lt. Christopher N. Rutherford, 25, of Newport, Ohio, died July 2 near Balad, Iraq, of wounds suffered when an improvised explosive device detonated near his vehicle. He was assigned to the Forward Support Group, 19th Engineer Battalion, Fort Knox, Ky.
Pfc. Steven A. Davis, 23, of Woodbridge, Va., died July 4 in Baghdad, Iraq, of wounds suffered when insurgents attacked his unit with grenades. He was assigned to the 2nd Battalion, 12th Infantry Regiment, 2nd Brigade Combat Team, 2nd Infantry Division, Fort Carson, Colo.
Chief Warrant Officer Scott A.M. Oswell, 33, of Washington, died July 4 in Mosul, Iraq, of wounds suffered when his helicopter struck a power line. He was assigned to the 4th Squadron, 6th U.S. Air Cavalry, Fort Lewis, Wash.
Pfc. Andrew T. Engstrom, 22, of Slaton, Texas, died July 4 in Taji, Iraq, from injuries suffered in a non-combat related incident. His death is under investigation. The quote of the day on that page: Why should we hear about body bags, and deaths...I mean, it's not relevant. So why should I waste my beautiful mind on something like that? Last edited by dori on Sat Jul 07, 2007 11:50 pm, edited 1 time in total. The military said roadside bombs killed four soldiers in Baghdad, three on Friday and one on Thursday. It said two Marines were killed in combat in Anbar province on Thursday. U.S. casualties have risen sharply in the past few months. This has put President George W. Bush under mounting pressure from Democrats and increasingly from senior figures in his own Republican Party to show his war strategy is working after ordering 28,000 more troops to Iraq. There are now 157,000 U.S. military personnel in the country. The April-June period was the deadliest three months for U.S. troops since the March 2003 U.S.-led invasion. So far this month 20 soldiers have been killed, half of them in Baghdad. Nearly 3,600 U.S. soldiers have been killed in the conflict. Sgt. Keith A. Kline, 24, of Oak Harbor, Ohio. died July 5 when their vehicle struck an improvised explosive device in Baghdad, Iraq. They were assigned to 96th Civil Affairs Battalion, 95th Civil Affairs Brigade, Fort Bragg, N.C..
Spc. Michelle R. Ring, 24, of Martin, Tenn., died July 5 of wounds sustained from enemy mortar fire in Baghdad, Iraq. She was assigned to the 92d Military Police Battalion, Fort Benning, Ga.
Lance Cpl. Steven A. Stacy, 23, of Coos Bay, Ore. diedJuly 5 from wounds suffered while conducting combat operations in Al Anbar province, Iraq. Allbaugh was assigned to 1st Battalion, 4th Marine Regiment, 1st Marine Division, I Marine Expeditionary Force, Camp Pendleton, Calif. Stacy was assigned to 3rd Battalion, 1st Marine Regiment, 1st Marine Division, I Marine Expeditionary Force, Camp Pendleton, Calif.
Spc. Jeremy L. Stacey, 23, of Bismarck, Ark., died July 5 in Baghdad, Iraq, of wounds suffered from an improvised explosive device. He was assigned to the 2nd Battalion, 12th Cavalry Regiment, 4th Brigade Combat Team, 1st Cavalry Division, Fort Bliss, Texas. Spc. Anthony M.K. Vinnedge, 24, of Okeana, Ohio, died July 5 at the Radwaniyah Palace Complex, Iraq, of injuries suffered from a non-combat related incident. The incident is under investigation. Col. Jon M. Lockey, 44, of Fredericksburg, Va., died July 6 in Baghdad, Iraq, of injuries sustained from a non-combat related incident. Petty Officer First Class Steven Phillip Daugherty, 28, of Barstow, Calif. died July 6 as a result of enemy action while conducting combat operations in the vicinity of Baghdad, Iraq. The three sailors were assigned to an East Coast-based SEAL team. Pfc. Le Ron A. Wilson, 18, of Queens, N.Y. He was assigned to the 26th Brigade Support Battalion, 2nd Brigade, 3rd Infantry Division, Fort Stewart, Ga, died July 6 in Iraq of wounds suffered when an improvised explosive device detonated near their vehicle. Pfc. Bruce C. Salazar Jr., 24, of Tracy, Calif. He was assigned to the 1st Battalion, 30th Infantry Regiment, 2nd Brigade Combat Team, 3rd Infantry Division, Fort Stewart, Ga. died July 6 in Muhammad Sath, Iraq, of wounds sustained from an improvised explosive device. Sgt. Eric A. Lill, 28, of Chicago, died July 6 in Rustamiyah, Iraq, of wounds suffered when an improvised explosive device detonated near his vehicle during combat operations in Baghdad. He was assigned to the 2nd Battalion, 17th Field Artillery Regiment, 2nd Brigade Combat Team, 2nd Infantry Division, Fort Carson, Colo.
Pfc. Jason E. Dore, 25, of Moscow, Maine, died July 8 in Baghdad, Iraq, of wounds suffered from an improvised explosive device. He was assigned to the 2nd Battalion, 5th Cavalry Regiment, 1st Brigade Combat Team, 1st Cavalry Division, Fort Hood, Texas. Last edited by dori on Sat Jul 14, 2007 6:11 pm, edited 1 time in total. Capt. Maria I. Ortiz, 40, of Bayamon, P.R., died July 10 in Baghdad, Iraq, of wounds suffered from enemy indirect fire. She was assigned to the Kirk U.S. Army Health Clinic, Aberdeen Proving Ground, Md. 1st Sgt. Jeffrey R. McKinney, 40, of Garland, Texas, died July 11 in Adhamiyah, Iraq, of injuries suffered from a non-combat related incident.He was assigned to the 1st Battalion, 26th Infantry Regiment, 2nd Brigade Combat Team, 1st Infantry Division, Schweinfurt, Germany. Sgt. Courtney T. Johnson, 26, of Garner, N.C., died July 11 in Besmaya, Iraq, of wounds sustained when insurgents attacked his unit with indirect fire. He was assigned to the 3rd Brigade Special Troops Battalion, 3rd Brigade Combat Team, 3rd Infantry Division, Fort Benning, Ga.
Sgt. John R. Massey, 29, of Judsonia, Ark., died July 15 in Balad, Iraq, of wounds suffered when an improvised explosive device detonated near his vehicle during combat operations July 14 in Baghdad, Iraq. He was assigned to C Battery, 142nd Fires Brigade, Arkansas Army National Guard, Ozark, Ark. Pfc. Christopher D. Kube, 18, of Sterling Heights, Mich., died July 14 in Baghdad, Iraq, of wounds suffered from an improvised explosive device. He was assigned to the 2nd Battalion, 17th Field Artillery Regiment, 2nd Brigade Combat Team, 2nd Infantry Division, Fort Carson, Colo.
Last edited by dori on Tue Jul 24, 2007 10:41 am, edited 3 times in total. Click on above link to check information about, and pictures of individual victims of our disasterous war in Iraq. Another site to check, more information about our service people who lost their lives in Bush's great drive for empire. Now if we could only drag the real death toll out of their lying mouth's. Got a phone call on the 8th from my mother. My cousin who was a navy seal was hit by a IED. There were some injured and he took some heavy damage to his leg. He was not able to tell his mother if there were any casualty's. He couldn't talk about it. Of course they hate me for not supporting this war. I can still remember him being a curly headed little kid. I wonder what he looks like now. Sorry to hear about your cousin, CE. He will never be the same, so many people will never be the same. The United States will never be the same, and certainly Iraq won't. War represents the failure of humans. Spc. Eric M. Holke, 31, of Crestline, Calif., died July 15 in Tallil, Iraq, of wounds sustained from a non-combat related incident. His death is under investigation. Spc. Robert D. Varga, 24, of Monroe City, Mo., died July 15 in Baghdad, Iraq, of injuries suffered from a non-combat related incident. He was assigned to the 984th Military Police Company, 759th Military Police Battalion, Fort Carson, Colo.
Lance Cpl. Shawn V. Starkovich, 20, of Arlington, Wash., died July 16 in Al Anbar province, Iraq. His death is under investigation. Starkovich was assigned to 3rd Battalion, 1st Marine Regiment, 1st Marine Division, I Marine Expeditionary Force, Camp Pendleton, Calif. For more information in regard to this release the media can contact the Camp Pendleton public affairs office (760) 725-5044. Pfc. James J. Harrelson, 19, of Dadeville, Ala., died July 17 in Baghdad, Iraq, of wounds suffered from an improvised explosive device. He was assigned to the 2nd Battalion, 16th Infantry Regiment, 4th Infantry Brigade Combat Team, 1st Infantry Division, Fort Riley, Kan. Petty Officer First Class Jeffrey L. Chaney, 35, of Omaha, Neb. died July 17 as a result of enemy action while conducting combat operations in Salah Ad Din Province, Iraq. The two sailors were assigned to Explosive Ordnance Disposal Mobile Unit Eleven, Naval Air Station Whidbey Island, Wash.
Sgt. Nathan S. Barnes, 23, of American Fork, Utah, died July 17 in Rushdi Mullah, Iraq, of wounds suffered when his unit was attacked by insurgents using small arms fire. He was assigned to the 4th Battalion, 31st Infantry Regiment, 2nd Brigade Combat Team, 10th Mountain Division, Fort Drum, N.Y.
Pfc. Brandon K. Bobb, 20, of Orlando, Fla. died July 17 in Baghdad, Iraq, of wounds suffered when an improvised explosive device detonated near their vehicle. They were assigned to the 401st Military Police Company, 92nd Military Police Battalion, 89th Military Police Brigade, Fort Hood, Texas. Spc. Daniel E. Gomez, 21, of Warner Robbins, Ga. died July 18 in Adhamiyah, Iraq, of wounds sustained when their vehicle was attacked by enemy forces using an improvised explosive device and small arms fire. The Soldiers were assigned to the 1st Battalion, 26th Infantry, 2nd Brigade Combat Team, 1st Infantry Division, Schweinfurt, Germany. Pfc. Brandon M. Craig, 25, of Earleville, Md., died July 19 in Husayniyah, Iraq, of wounds sustained from an improvised explosive device. He was assigned to Headquarters and Headquarters Company, 4th Brigade, 2nd Infantry Division (Stryker Brigade Combat Team), Fort Lewis, Wash.
Sgt. Ronald L. Coffelt, 36, of Fair Oaks, Calif., died July 19 in Baghdad, Iraq, of wounds suffered from an improvised explosive device. He was assigned to the 503rd Military Police Battalion, 16th Military Police Brigade (Airborne), XVIII Airborne Corps, Fort Bragg, N.C.
Cpl. Rhett A. Butler, 22, of Fort Worth, Texas, died July 20 of wounds suffered when his vehicle struck an improvised explosive device in Khan Bani Sa’d, Iraq. He was assigned to 2nd Squadron, 1st Cavalry Regiment, 4th Brigade, 2nd Infantry Division (Stryker Brigade Combat Team), Fort Lewis, Washington. America does not go abroad in search of monsters to destroy. She is the well-wisher to the freedom and independence of all. Last edited by dori on Sat Jul 28, 2007 12:07 am, edited 1 time in total. Sgt. Jacob S. Schmuecker, 27, of Atkinson, Neb., died July 21 in Balad, Iraq, of wounds suffered from an improvised explosive device. He was assigned to the 755th Recon/Decon Company, Nebraska Army National Guard, Oneill, Neb. A 13th SC(E) Soldier was killed July 21 as a result of injuries sustained when an improvised explosive device detonated near his Humvee while conducting a combat logistics patrol south of Samarra, Iraq. Cpl. Christopher G. Scherer, 21, of East Northport, N.Y., died July 21 from wounds suffered while conducting combat operations in Al Anbar province, Iraq. He was assigned to 1st Combat Engineer Battalion, 1st Marine Division, I Marine Expeditionary Force, Camp Pendleton, Calif.
Lance Cpl. Bobby L. Twitty, 20, of Bedias, Texas, died July 22 from a non-hostile vehicle accident in Al Anbar province, Iraq. He was assigned to Combat Logistics Battalion 6, Combat Logistics Regiment 2, 2nd Marine Logistics Group, II Marine Expeditionary Force, Camp Lejeune, N.C.
Sgt. Shawn G. Adams, 21, of Dixon, Calif., died July 22, in Owaset, Iraq, of wounds suffered from an improvised explosive device. He was assigned to the 3rd Battalion, 509th Parachute Infantry Regiment, 4th Brigade Combat Team (Airborne), 25th Infantry Division, Fort Richardson, Alaska. Sgt. Courtney D. Finch, 27, of Leavenworth, Kan., died July 24 in Qayyarah, Iraq, of injuries sustained from a non-combat related incident. He was assigned to the 714th Maintenance Company, Kansas Army National Guard, Topeka, Kan.
Cpl. Matthew R. Zindars, 21, of Watertown, Wis. died July 24 while conducting combat operations in Diyala province, Iraq. Lynch was assigned to 1st Battalion, 12th Marine Regiment, 3rd Marine Division, III Marine Expeditionary Force, Okinawa, Japan. McRae was assigned to 3rd Maintenance Battalion, Combat Logistics Regiment 35, 3rd Marine Logistics Group, III Marine Expeditionary Force, Okinawa, Japan. Zindars was assigned to 2nd Battalion, 11th Marine Regiment, 1st Marine Division, I Marine Expeditionary Force, Camp Pendleton, Calif.
Hospitalman Daniel S. Noble, 21, of Whittier, Calif., died July 24, as a result of enemy action while conducting security operations in the Dilaya Province, Iraq. He was permanently assigned to 1st Marine Division, Fleet Marine Force Pacific, Camp Pendleton, Calif.
Staff Sgt. Joshua P. Mattero, 29, of San Diego, died July 24 in Baqubah, Iraq, of wounds suffered from an improvised explosive device. He was assigned to the 749th Ordnance Company, 63rd Explosive Ordnance Battalion, Andrews Air Force Base, Md. Spc. Daniel A. Leckel, 19, of Medford, Ore., died July 25 in Baghdad, Iraq, of wounds suffered from enemy small arms fire. He was assigned to the 1st Battalion, 28th Infantry Regiment, 4th Infantry Brigade Combat Team, 1st Infantry Division, Fort Riley, Kan.
Pvt. Michael A. Baloga, 21, of Everett, Wash., died July 26 in Muqdadiyah, Iraq, of wounds suffered from an improvised explosive device. He was assigned to the 6th Squadron, 9th Cavalry Regiment, 3rd Brigade Combat Team, 1st Cavalry Division, Fort Hood, Texas. Spc. Jaime Rodriguez, Jr., 19, of Oxnard, Calif., died July 26 in Saqlawiyah, Iraq of wounds sustained when an improvised explosive device detonated near their vehicle. They were assigned to the 5th Squadron, 7th Cavalry Regiment, 1st Brigade Combat Team, 3rd Infantry Division, Fort Stewart, Ga.
Staff Sgt. Wilberto Suliveras, 38, of Humacao, P.R., died July 29 in Taji, Iraq, of wounds suffered from enemy small arms fire. He was assigned to the 2nd Battalion, 8th Cavalry Regiment, 1st Brigade Combat Team, 1st Cavalry Division, Fort Hood, Texas. Pfc. Cody C. Grater, 20, of Spring Hill, Fla., died July 29 in Baghdad, Iraq, of wounds suffered from enemy direct fire. He was assigned to the 407th Brigade Support Battalion, 2nd Brigade Combat Team, 82nd Airborne Division, Fort Bragg, N.C.
Army Staff Sgt. Jack D. Richards, 39, was on medical leave and receiving treatment at Fort Bragg when he died, said his sister, Pam Schultz of Broken Arrow. Richards nearly lost a leg when a roadside bomb exploded near his Humvee in 2004. War is the tool of small-minded scoundrels who worship the death of others on the altar of their greed.